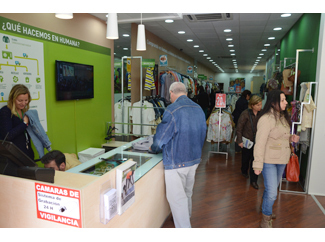 The Humana second hand store chain of sustainable clothes opens today a new shop in Madrid. Located in 5, Luchana Street, close to Bilbao Square, the store spans 180 square meters across two floors and is capable of holding 6,000 clothes for women, men and children, as well as fashion accessories and home textile. All of them are high quality products at low prices. Nowadays Humana has 29 stores in Spain: 13 in Madrid, 12 in Barcelona and its metropolitan area, 2 in Granada and 2 in Seville. The funds generated by the Humana stores allow the financing and development of cooperation projects in Africa, Latin America and Asia and welfare programs in Spain.